shout out Archives - Page 3 of 3 - Oy Vegan! By jamie on March 21, 2012 in Reflections, shout out, Special Alert! Last Wednes­day evening I joined a packed room in Uni­ver­sity of Toronto’s Multi-Faith Cen­tre for a night of cook­ing and con­ver­sa­tion. Cook­ing and demon­strat­ing for us were two top chefs from Israel– one Mus­lim and one Jew­ish. Ibrahim Abu Seir is the head pas­try chef at Jerusalem’s 5 star David Citadel Hotel and Joseph Elad is the owner of Menahe Yehuda Resu­tau­rant. The room was filled with Mus­lims, Chris­tians and Jews at every table. The pur­pose of the evening was to bring all three faiths together in a pos­i­tive way– through food. While we helped the chefs pre­pare our din­ner, we were also encour­aged to dis­cuss whether or not we thought peace could be achieved in Israel. The dis­cus­sion was very inter­est­ing and for the most part quite pos­i­tive. When one stu­dent started to bring up cer­tain anti-Israeli sen­ti­ments she had wit­nessed on U of T cam­pus, founder and dis­cus­sion facil­i­ta­tor, Kevork Aleimian, was quick to get the con­ver­sa­tion back on track. Aleimian is Armen­ian and also from Israel. Aleimian explained Chefs for Peace is a not-for-profit with a dream of peace. Founded in 2001, it is com­prised of chefs from all over the world from dif­fer­ent reli­gious back­grounds and its goal to is to encour­age peace­ful coex­is­tence. He explained that it’s easy to focus on who did what to who and dwell in the past, but the only way to bring about peace is by work­ing together to focus on it. The meal we were served was deli­cious. An Israeli cucum­ber tomato salad, a beau­ti­fully spiced rice and veg­etable dish and a dessert of fresh figs in coconut milk with a berry coulis on top. All veg­e­tar­ian, all kosher, and all halal. I had a really inter­est­ing con­ver­sa­tion about the sim­i­lar­i­ties and dif­fer­ences between what makes some­thing kosher and what makes some­thing halal with a girl of Mus­lim faith at my table. I think that every­one who attended learned a lot about each other in a pos­i­tive envi­ron­ment. If only there were more pro­grams like this, the world would be a more peace­ful place. For more infor­ma­tion visit chefsforpeace.com. Spe­cial shout out to Emily Berg, the Wol­fond Cen­tre Hil­lel team and all the other orga­ni­za­tions that brought Chefs for Peace to Toronto for a week of amaz­ing events! Shamayim V’Aretz– What Mayim Bialik, Matisyahu, and I have in common! By jamie on March 4, 2012 in shout out, Special Alert! Call­ing all Jew­ish peo­ple– veg­e­tar­ian, vegan and non-veg! I’m very excited to announce a new project out in L.A. started by Rabbi Shmuly Yan­klowitz called The Shamayim V’Aretz Insti­tute. Hear Rav Shmuly talk about Shamayim V’Aretz! The Shamayim V’Aretz Insti­tute is the spir­i­tual cen­ter inter­twin­ing learn­ing and lead­er­ship around the inter­sect­ing issues of ani­mal wel­fare activism, kosher veg­an­ism, and Jew­ish spir­i­tu­al­ity, for those any­where on the jour­ney towards com­pas­sion­ate eat­ing and liv­ing within Judaism. The Insti­tute trains lead­ers to address the abuse of ani­mals, injus­tices in kosher slaugh­ter­houses, and other ani­mal wel­fare issues while also serv­ing as an edu­ca­tional resource to help peo­ple make informed and pas­sion­ate Jew­ish moral choices about their eth­i­cal consumption. It’s about time that some­one started some­thing like this, and I’m so excited that Rav Shmuly has taken this on. Com­pas­sion­ate liv­ing and eat­ing is an eth­i­cal and moral issue. As Jew­ish peo­ple, we have a respon­si­bil­ity to strive to improve con­di­tions for our planet and all its creatures. And I’m not the only one who thinks so… Rav Shmuly has assem­bled a top notch team of found­ing mem­bers and advi­sory com­mi­tee mem­bers includ­ing Mayim Bia­lik (Blos­som), Matisyahu, Jana Kohl, Ellen Lavinthal and yours truly. Watch Mayim’s hilar­i­ous promo video below! For more infor­ma­tion about the insti­tute visit www.shamayimvaretz.com. Also, be sure to check out their upcom­ing spir­i­tual retreat on Sun­day June 3rd in L.A.! Just want to shout out Ms. Mayim Bia­lik for her pos­i­tive influ­ence on young girls every­where. Mayim Bia­lik, fea­tured on hit TV show The Big Bang The­ory and star of clas­sic sit­com Blos­som, dishes about her par­ent­ing style, her veg­an­ism, and her envi­ron­men­tal and ani­mal activism. Read the inter­view here! Cool blog eco­razzi! 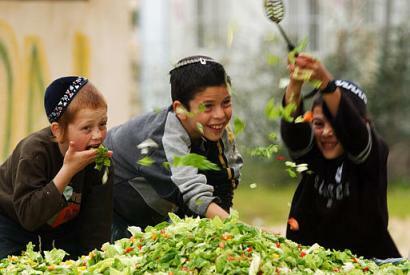 Shout out to veggiejews.org for this inter­est­ing arti­cle on how being Eco-kosher really means being veggie! Organic Vegan Fast Food Truck! 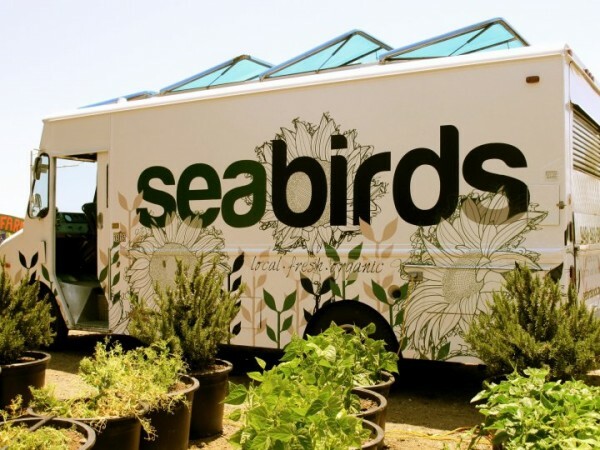 Check out the Seabirds Truck. These ladies in Cal­i­for­nia have a super cool organic vegan food truck with a menu com­prised of local organic food such as beer-battered avo­cado tacos and zuc­chini water­cress soup. Ellen DeGeneres shouted them out on her 1400th episode yesterday. If this is the future of fast food on the go, then I’m excited! I’d just like to shout-out Makom in Toronto’s Kens­ing­ton Mar­ket neigh­bour­hood for all the cool stuff they’re doing. Led by a vegan rabbi, they have super inter­est­ing events like tonight’s Shab­bat ser­vice and veg­e­tar­ian potluck in the sukkah!